Accelerate Resources Limited (ASX:AX8) today announced the discovery of multiple semi-massive pyrite veins in diamond drill hole TCDD003 at the Thomas Creek cobalt-copper-gold prospect. The intersection of multiple zones of semi-massive pyrite veining in TCDD003 is similar to that hosting significant cobalt mineralisation associated with sulphide veining in TCDD001, which was reported on July 11. TCDD001 had returned significant cobalt results from similar semi massive pyriite veining including 3m at 0.23% cobalt in similar semi-massive pyrite veins within a zone of coarsely disseminated pyrite. 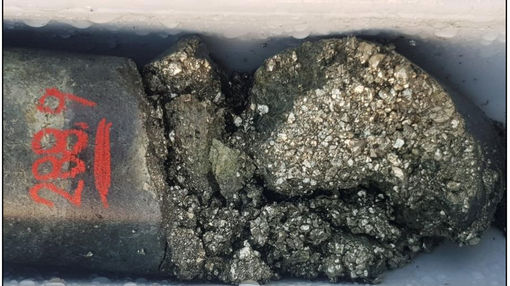 Drill hole TCDD003 ended at 357.90m and targeted a large IP chargeability anomaly directly below a surface sampling location which was sampled in 2017 and returned results including, 3300ppm cobalt, 1.52% copper and 0.59 g/t gold from saprolitic bedrock beneath peaty soil cover. The inclined hole (-550 dip, 0450 azimuth) intersected disseminated pyrite (trace to 5%) within altered andesites and monzodiorites throughout the hole. 167.70m to 169.15m 15% semi-massive pyrite with clots up to 15mm and minor (1%) chalcopyrite veinlets. 277.20m to 278.90m 25% coarsely disseminated pyrite in altered andesite. 282.20m to 283.20m 15% coarsely disseminated pyrite and trace disseminated chalcopyrite. 302.90m to 304.30m 70% semi-massive pyrite vein, coarsely crystalline. 326.30m to 326.80m 15% semi-massive pyrite in altered andesite breccia. 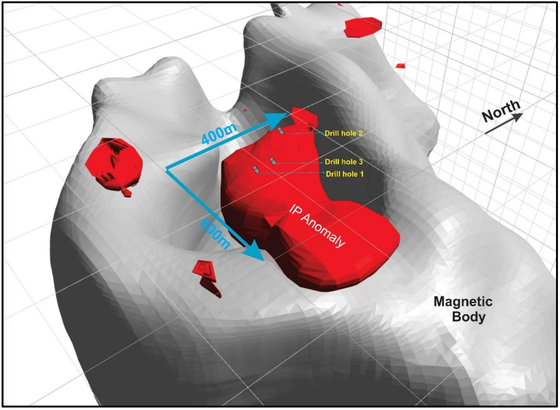 Drill hole TCDD003 targeted a large chargeable IP anomaly located along the eastern margin of an ovoid aeromagnetic body, below a surface copper-cobalt anomaly. The chargeable anomaly has dimensions of approximately 400m width by 600 metres in length. The depth to the top of the IP anomaly is approximately 100m below the surface. The findings are highly encouraging and confirm the potential of the Thomas Creek copper-cobalt prospect to host further mineralisation in this large and relatively untested target.